A stroke or injuries to the central or peripheral nervous system may lead to paralysis in the shoulder. You experience pain and moving your arm is difficult for you. Partial dislocation of the humerus head from the socket (shoulder joint) is one reason for shoulder pain. The Omo Neurexa corrects the alignment of the humerus head with the joint socket and therefore alleviates the cause of the pain. It helps stabilise the shoulder and position it correctly again. The Omo Neurexa shoulder orthosis provides noticeable relief, alleviates pain and leads to a better overall body posture. Thanks to the hook-and-loop closures, the orthosis can be fully opened. This also makes it easier for another person to put on and take off. The strain relieving straps can be individually adjusted by your orthopaedic technician for the best possible positioning of the shoulder. The Omo Neurexa provides noticeable relief and alleviates pain caused by the malposition of your shoulder joint. 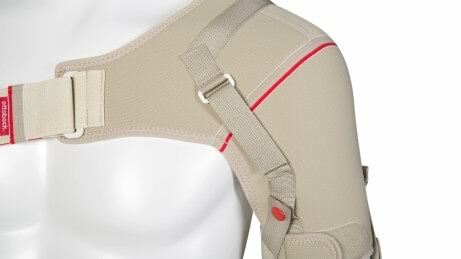 By bringing your shoulder into a better position, the shoulder orthosis combats the cause of your complaints. Relieving pain is important so that you can focus on beginning with gait training. The sooner you begin with rehabilitation, the more successful you can be. With the Omo Neurexa, your shoulder is securely stabilised so that you can fully concentrate on movement and gait training. Rather than internalising incorrect movement patterns from the outset, you begin with rehabilitation as early as possible. By bringing your shoulder into the correct position with the Omo Neurexa, your entire body posture is corrected. This also affects your gait pattern, which becomes more natural and smoother again. What's more, you avoid one-sided excessive muscle strain or the overextension of nerves, ligaments and tendons, which in turn could lead to pain that is not caused by your shoulder injury. The Omo Neurexa is made of a very soft and comfortable material (Outlast) that is machine-washable at 40°. 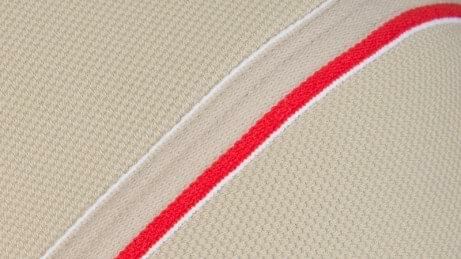 Soft edges prevent chafing and sores. If you wear the orthosis all day, reducing perspiration is of course important. This is why the Omo Neurexa is made of a temperature regulating material which offers you the required comfort. The forearm and shoulder sections of the orthosis are joined by silicone strips on the inner side. Therefore it cannot slip. Snap fasteners in different colours make it easier to put the orthosis on correctly. The Omo Neurexa can also be fully opened, which makes it easier to put on as well. Your therapist or orthopaedic technician will adapt the orthosis to your individual needs. Proper application will also be explained to your family members or attendants, so that they can help you put on the orthosis if required. 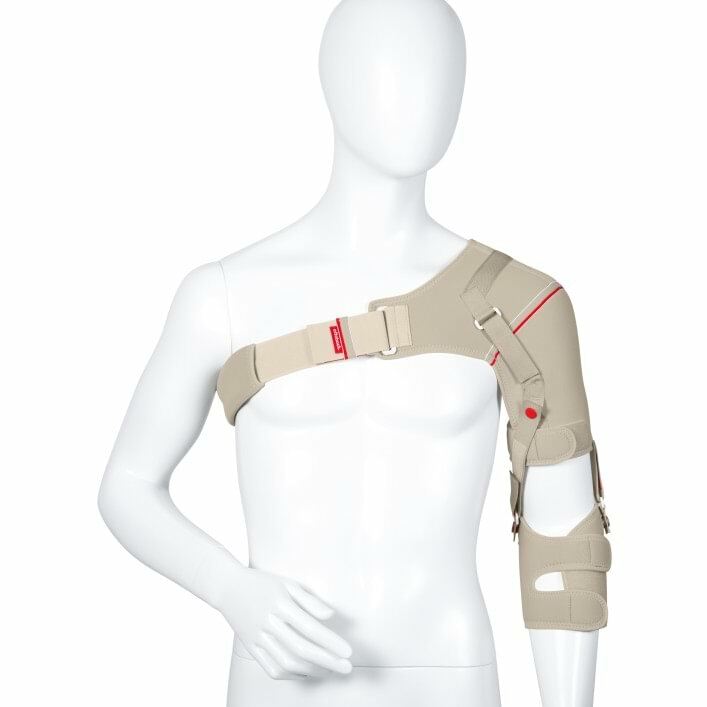 The Omo Neurexa shoulder orthosis is part of the Neurexa product line. It was developed in close cooperation with doctors and therapists – especially for stroke patients. 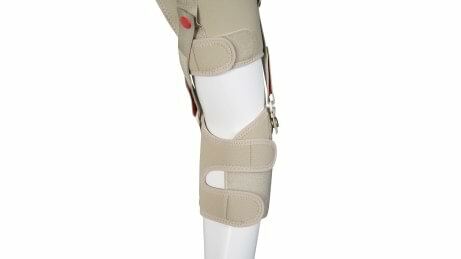 As a valuable medical aid for rehabilitation, it promotes active movement. Shoulder pain is frequent after a stroke or other illnesses. In this case the upper arm bone (humerus head) is in an unfavourable position. The Omo Neurexa brings it back into the correct position, thereby eliminating the cause of the pain. This is essential in order to begin with early, targeted rehabilitation. Our objective is to help you reintegrate into your familiar social and work environment as quickly as possible. The Omo Neurexa consists of two parts – a shoulder cuff and a forearm cuff. They are connected by two straps. The orthosis covers a large area in the shoulder region, which has a positive effect on what are known as proprioceptors – which means you perceive how you move with your shoulder in space and what position you assume. This improves your overall body posture, which in turn has a positive impact on a smooth and uniform gait. A muscle stimulation pad, which you can easily attach inside the shoulder orthosis with a hook-and-loop fastener, makes it possible to provide additional stimulation for weakened muscles. Shoulder pain and dysfunction (including subluxation) for example after stroke, lumbar disc herniation in the cervical spine, peripheral nerve damage etc.